Questions of entanglement, connectivity and interrelatedness have been on the international research agenda in recent years, especially in research areas engaged in transnational and transregional frameworks. However, whereas the moves of people, goods and ideas have been studied in detail, the nature of the relations established within these moves has been neglected, as well as the seemingly basic concept of relations altogether. Yet, broadly speaking, relations lie at the heart of just about any human social activity. Relations occur, at the least, between humans themselves, humans and their productions, humans and their environment, and humans and the divine. 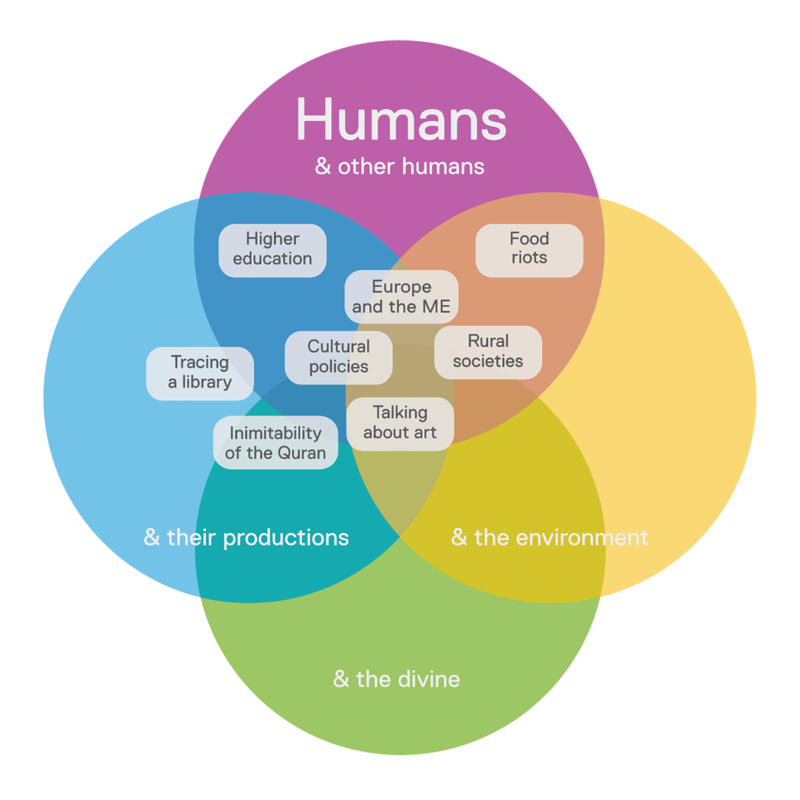 Human-human relations can be inter-personal on the micro-level of analysis, they can be inter-social (inter-group) on the meso-level and they can be inter-national or inter-regional on the macro-level of analysis. On the micro-level relationships of kinship, friendship and neighbourliness will be a research focus. How do such relationships work and how can we analyse them? Kinship relations, for example, can no longer be looked at solely through the lens of genetics. Friendship is not solely an emotional relation of pure voluntariness. Both are in many ways imagined and constructed. Conversely, the concept of neighbourhood is primarily one of non-voluntary spatial closeness, which seems to operate under the normative assumption of “(good) neighbourliness”. Looking at the connectivity between state and society, and the quality of relations between state actors and society actors as well as intra-society relations (labour relations, gender relations, generational relations) is as important as looking at the institutions and forces of societies in the realms of scholarship, art, and media. Here, relations between media and the public, between the wide field of scholarly, artistic and literary production and its reception are a special focus, as are relations between societies and their material environments (nature, architecture, archaeology) and relations concerning the production of theological and religious knowledge. On the macro-level the relations between the Middle East and other world regions (Europe, Asia, Africa, the Americas) raise theoretical questions which can only be answered by consulting the theories and approaches of a number of disciplines (International Relations, History, Sociology, Psychology), but also Islamic and other Area Studies. This also entails the problematic of disciplinary knowledge and area knowledge. The medium turn research agenda will focus on the question of “relations”, with the first short term research theme being “neighbourliness: neighbourhood relations” as a predominantly spatial form of relations. The borders of neighbourhoods are special boundaries that can easily turn into spaces of violence when they are transgressed. This is true for the micro-, meso- and macro-level of neighbourhood boundaries. At the same time, when proverbial neighbourliness works it can be a strong source of support and even save lives in times of crises. For 2018, a conference and multiple other activities are planned around this topic.